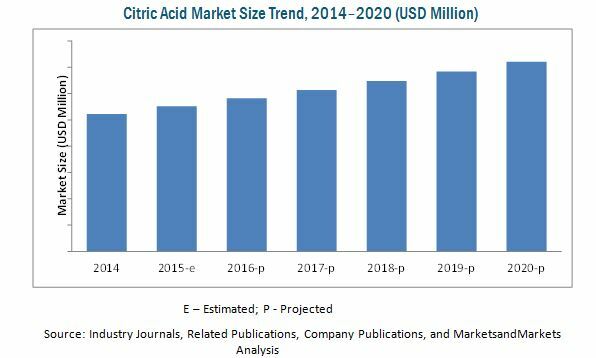 The citric acid market is directly influenced by the growth of food additives in the processed food industry. Consumer interest in food & beverage products prepared from safe ingredients is projected to remain strong during the forecast years. Moreover, increasing application in the pharmaceutical & personal care industries also help in augmenting market demand for citric acid products. Citric acid helps manufacturers in offering a clean label to their products, and satisfying consumer demand for safe and permitted ingredients within their budget. However, manufacturers face intense competition from inter- and intra-industry peers in sourcing raw material, ultimately restraining the market growth to a significant extent. The global market is projected to witness augmented growth due to surging demand for citric acid in food & beverages, pharmaceuticals, detergents, cosmetics & personal care products. The report estimates the market size, in terms of value and volume, of citric acid, based on their form, function, application, and region. The report provides a detailed analysis of the citric acid market, which is segmented into two major forms- anhydrous citric acid and liquid citric acid. The market has also been segmented on the basis of its main function- acidulant, preservatives, antioxidant, and sequestrant. The report provides a comprehensive analysis of the citric acid market for new and existing players in the food processing, animal feed, pharmaceutical, and personal care industries. The regions covered in this report are North America, Europe, Asia-Pacific, and Rest of the World (RoW). The market is further segmented on the basis of the key countries in these regions. The global market stood at USD 2.6 Billion in 2014, at USD 3.6 Billion by 2020 and is projected to grow at a CAGR of 5.5% from 2015 to 2020. The European region accounted for the largest share in the market in 2014, owing to the heavy demand for functional food additives from the flourishing processed food & beverage market of the region. Food as an application dominates the market with more than three-fourth share, in terms of value as well as volume. It is the fastest-growing application, and is expected to continue to be, during the forecast years. The market for citric acid for application in the pharmaceutical and personal care sectors is emerging with substantial opportunities and is projected to grow at a competitive CAGR from 2015 to 2020. Anhydrous citric acid is the most preferable form, owing to its ease of transportation and longer shelf life. The report provides a qualitative analysis of the leading players in the market. It also enumerates the development strategies preferred by these players. The market dynamics—in terms of market drivers, restraints, opportunities, and challenges are discussed in detail in the report. Key players profiled in the report include Archer-Daniels-Midland Company (U.S.), Cargill, Incorporated (U.S.), Tate & Lyle PLC (U.K.) and JUNGBUNZLAUER SUISSE AG (Switzerland), COFCO Biochemical (AnHui) Co., Ltd. (China), HUANGSHI XINGHUA BIOCHEMICAL CO.LTD (China), RZBC Group Co. Ltd. (China), Weifang Ensign Industry Co., Ltd. (China), Gadot Biochemical Industries Limited (Israel), and S.A. Citrique Belge N.V. (Belgium). This study categorizes the global market on the basis of form, function, application, and region. The regional analysis is further extended with projections of the market size of their key contributing countries. The global market is growing in accordance with the advancement of the processed food industry and increasing applications in the pharmaceutical, personal care & cosmetics, detergents & cleansers sectors. The citric acid market is considered to be one of the fastest-growing segments of the food additives market for its versatile functionalities as a flavor enhancer, acidulant, antioxidant, preservative, buffering agent, and sequestrant. The market is segmented on the basis of key forms, functions, applications, and regions. The citric acid industry is restrained by scarcity if raw materials and intense competition for the same. Emerging applications of citric acid in pharmaceuticals, personal care, and cosmetics are estimated to be the key driving factors for the citric acid market. The global market stood at USD 2.6 Billion in 2014, at USD 3.6 Billion by 2020 and is projected to grow at a CAGR of 5.5% from 2015 to 2020. owing to the flourishing food sector across the globe which is driving the market for various food additives, including citric acid. The global market in 2014 was dominated by anhydrous citric acid. 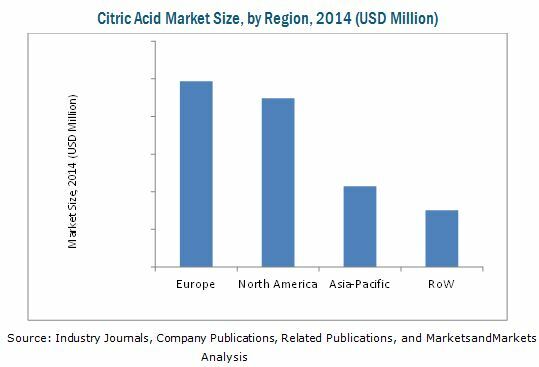 The citric acid market is fragmented, with the leading companies driving its growth. The report provides qualitative analyses of the prominent market players, their products, and preferred development strategies. Key players such as Archer-Daniels-Midland Company (U.S.), Cargill, Incorporated (U.S.), Tate & Lyle PLC (U.K.), JUNGBUNZLAUER SUISSE AG (Switzerland), COFCO Biochemical (AnHui) Co., Ltd. (China), Huangshi Xinghua Biochemical Co. Ltd. (China), RZBC Group Co. Ltd. (China), Weifang Ensign Industry Co., Ltd. (China), Gadot Biochemical Industries Limited (Israel), and S.A. Citrique Belge N.V. (Belgium) have been profiled in the report. The leading players have adopted new product development as their key development strategy to serve different consumers from food and non-food sectors in matured and untapped markets as well. They also focus on acquiring local players of the industry and developing a new customer base for long-term client relationships. This has not only enabled them to expand their geographical reach, but has also reinforced their market position by gaining a larger share in terms of revenue and product portfolios. Small-scale players also adopted this strategy to expand their businesses globally, by investing in the establishment of manufacturing facilities and global innovation centers in various regions. This organic growth strategy serves an important proposition for smaller companies, enabling them to improve their technical expertise through intensive R&D infrastructure offered by key players. 12.6 Cofco Biochemical (Anhui) Co., Ltd.
12.8 RZBC Group Co. Ltd.
12.9 Weifang Ensign Industry Co., Ltd.
12.10 Gadot Biochemical Industries Ltd.
12.11 S.A. Citrique Belge N.V.